Alice Walker is a famous Author from USA, she is 75 years old and still alive, born February 9, 1944. Alice Malsenior Walker was in her childhood characterized as cautious and was further very shy because of an accident that made ​​her blind in the eye and the sacrifice of much teasing and misunderstanding from her family's side. This happened at the age of only 8. All this changed, however, 6 years later, where a doctor removed scar tissue from her eye, but although she was both "Prom Queen" and "valedictorian" she felt still as an outsider, with a desire, in solitude, writing and read poetry. In 1961 she started at Spelman College, a very prominent school for African American women. 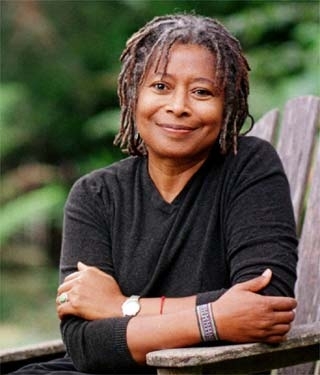 During the two years when she was in Atlanta, she was involved in "The Civil Rights Movement" and then moving to Sarah Lawrence College in New York. Here she continued to be involved in "The Civil Rights Movement" and met in the context of Martin Luther King Jr. She helped register black voters in Georgia, and these experiences have among others made ​​the starting of many poems and lectures. She has further been in Africa and experienced an unwanted pregnancy in this context. She is born under the zodiac aquarius, who is known for Knowledge, Humanitarian, Serious, Insightful, Duplicitous. Our collection contains 40 quotes who is written / told by Alice, under the main topics: Death, Happiness, Mom, Nature, Power. "How simple a thing it seems to me that to know ourselves as we are, we must know our mothers names"
"Don't wait around for other people to be happy for you. Any happiness you get you've got to make yourself"
"I think it pisses God off if you walk by the color purple in a field somewhere and don't notice it"
"Us sing and dance, make faces and give flower bouquets, trying to be loved. You ever notice that trees do everything to git attention we do, except walk?" "The quietly pacifist peaceful always die to make room for men who shout"
"The animals of the world exist for their own reasons. They were not made for humans any more than black people were made for white, or women created for men"
"It's so clear that you have to cherish everyone. I think that's what I get from these older black women, that every soul is to be cherished, that every flower Is to bloom"
"It no longer bothers me that I may be constantly searching for father figures; by this time, I have found several and dearly enjoyed knowing them all"
"I try to teach my heart not to want things it can't have"
"Writing saved me from the sin and inconvenience of violence"
"Is solace anywhere more comforting than that in the arms of a sister"
"Expect nothing. Live frugally on surprise"
"All partisan movements add to the fullness of our understanding of society as a whole. They never detract; or, in any case, one must not allow them to do so. Experience adds to experience"
"And so our mothers and grandmothers have, more often than not anonymously, handed on the creative spark, the seed of the flower they themselves never hoped to see - or like a sealed letter they could not plainly read"
"What the mind doesn't understand, it worships or fears"
"It is healthier, in any case, to write for the adults one's children will become than for the children one's "mature" critics often are"
"In nature, nothing is perfect and everything is perfect. Trees can be contorted, bent in weird ways, and they're still beautiful"
"Helped are those who create anything at all, for they shall relive the thrill of their own conception and realize a partnership in the creation of the Universe that keeps them responsible and cheerful"
"Any God I ever felt in church I brought in with me"
"Yes, Mother. I can see you are flawed. You have not hidden it. That is your greatest gift to me"
"People do not wish to appear foolish; to avoid the appearance of foolishness, they are willing to remain actually fools"
"All History is current; all injustice continues on some level, somewhere in the world"
"To me, the black black woman is our essential mother, the blacker she is the more us she is and to see the hatred that is turned on her is enough to make me despair, almost entirely, of our future as a people"
"People tend to think that life really does progress for everyone eventually, that people progress, but actually only some people progress. The rest of the people don't"
"In search of my mother's garden, I found my own"
"I think we have to own the fears that we have of each other, and then, in some practical way, some daily way, figure out how to see people differently than the way we were brought up to"
"Horses make a landscape look beautiful"
"Anybody can observe the Sabbath, but making it holy surely takes the rest of the week"
"Womanist is to feminist as purple is to lavender"